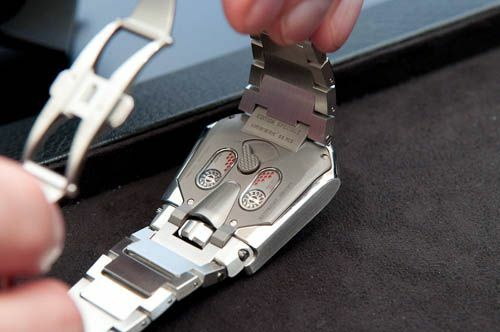 Urwerk is one of those brands where reading time isn’t the primary concern, as there are other devices (e.g. iPhone or BlackBerry) that are much more accurate and cheaper to do so. Now, this rule goes for every mechanical timepiece, but one could try to justify a $7,000.- USD Rolex for reading time and it will be quite difficult to do so with a +/- $70,000.- USD Urwerk UR-110 (nicknamed ‘Torpedo’). Urwerk is not about accuracy, reading time or creating ‘just’ an expensive luxury timepiece, it is about micro-engineering. Felix Baumgartner and Martin Frei, the founders of Urwerk, are trying (and I think they are succeeding) to follow nobody and set their own limits when it comes to haute horlogerie. Extreme horlogerie I would call their pieces of art, as the design and mechanics are very uncommon and one’s eyes need time to adjust when looking at their timepieces for the first time. 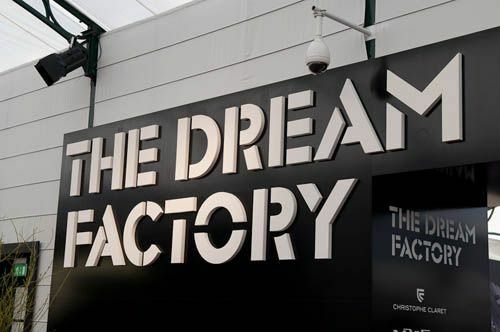 As soon as I entered the Dream Factory in Basel, I knew that I was going to be surprised by the works of Urwerk, MB&F, Christophe Claret and Speake-Marin. More on the others later this month. During my visit to the Urwerk booth, I tried and handled two of their timepieces. The Urwerk UR110 ‘Torpedo’ which I have been covering before here on Fratellowatches, and the Urwerk UR202S with stainless steel bracelet. The Urwerk 110 ‘Torpedo’ with its oil change indicator and moving and turning satellites was a feast for the eyes, especially to see the mechanics work as time is passing by. This timepiece is certainly coming alive when wearing it and playing with it. After three years, the oil change indicator will demonstrate that it’s time for a service as it will indicate ‘red’ to its wearer. The satellite system is impressive to see at work, as the satellite will flip over to the next upcoming hour when it is at 9 o’clock, as you can see on the picture above. The UR110 indicates it is 11:00 and the next satellite in line is transforming already from 9 to 12. 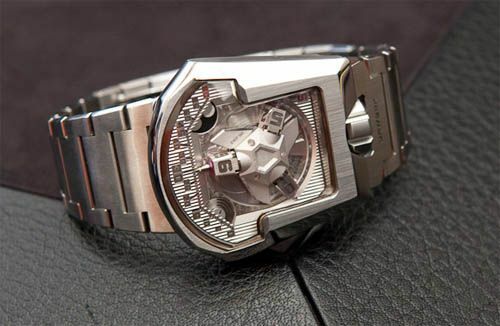 As you can see on the second picture in this article, the watch is actually quite wearable despite its unusual design. 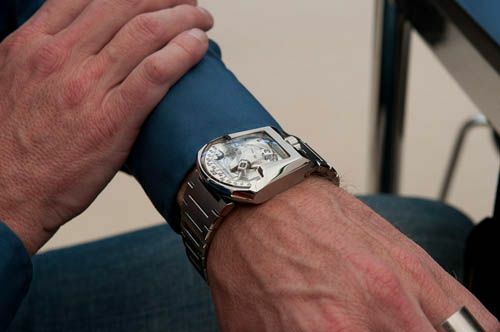 Even if your cuff partly slides over the watch, you will be able to tell time. 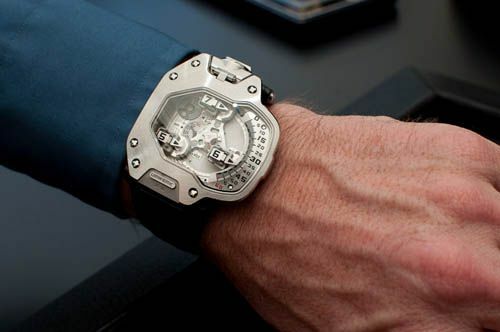 Another very cool timepiece that Urwerk showed me is their UR202S. 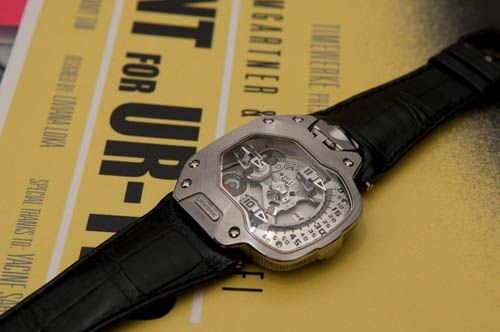 Based on the UR202, this ‘S’ model comes with a stainless steel bracelet. A bracelet that reminds me a lot of the Audemars Piguet Royal Oak bracelets. Perhaps because I am really a fan of those and wanted it to be like it, but the Urwerk representative told me I was thinking in the right direction. I’ll let you decide what that means. One of the neat features of the UR202S are the twin turbines that control the air friction by the rotor when spinning around in its free direction (note that this watch only winds in one direction). By setting the switch on the back of the watch, the wearer can indicate whether there is normal activity when wearing the UR202S, vigorous activity or extreme activity (think of playing golf with this watch on your wrist). In case of normal activity, the turbines will spin freely and are functioning as a cushion for sharp movements of the rotor. In vigorous mode, the twin turbines will reduce the rotor winding rate with approximately 35%. In its extreme mode, both the twin turbines and the rotor are fully blocked, protecting them from heavy shocks and abuse. Certainly a useful feature if you ask me. I have to say that although the UR110 is certainly an impressive work of art and engineering, the UR202S stole my heart. The bracelet design, the moon phase complication and twin turbine solution are definitely something I really appreciate in this timepiece. The price of approximately $150.000,- USD is holding me back, but I am sure there are collectors out there willing to pay for this magnificent piece of extreme horlogerie. More information about the bracelet has been posted in the Revo-Online forums by Ian Skellern. Click here.